Sweet Pea R has suddenly become very adept at finding anything green or dark in his food. He will often remove it, study it, and if he is unsure of what he has found, he will ask us, "what *is* this?" Last night we had Roasted Vegetable Lasagna and despite having had it many, many times, he started fishing around and found the broccoli (which he ate, phew!) and the mushrooms (which he did not eat. Sigh.) What can you do? For lunch we decided to have a green (color, not enviro) lunch. I figure any subliminal propaganda/indoctrination I can provide to be pro-green is a good thing, right? So I got a bunch of green things that he loves...cucumbers, avocado slices and kiwi. 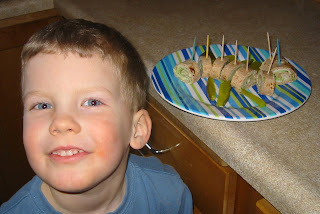 Then, since R is recently fascinated with toothpicks, I rolled up whole wheat tortillas spread with cream cheese and spinach (minced to hide it), and layered on some turkey and sliced cucumbers. I secured the roll with toothpicks and sliced it a la sushi rolls and made what we deemed, the caterpillar sandwich. A fun lunch to make, and according to R, even more fun to eat. Aww how cute! You are so creative! You're lucky kiwi's on the list of acceptable foods. My mom made fruit salad for Easter, which the girls loved...but *both* picked any visible kiwi! I like the idea of adding minced spinach to a turkey/cream cheese wrap! We've been doing whole wheat bagels with cream cheese and preserves...maybe I'll fix that for lunch next week!